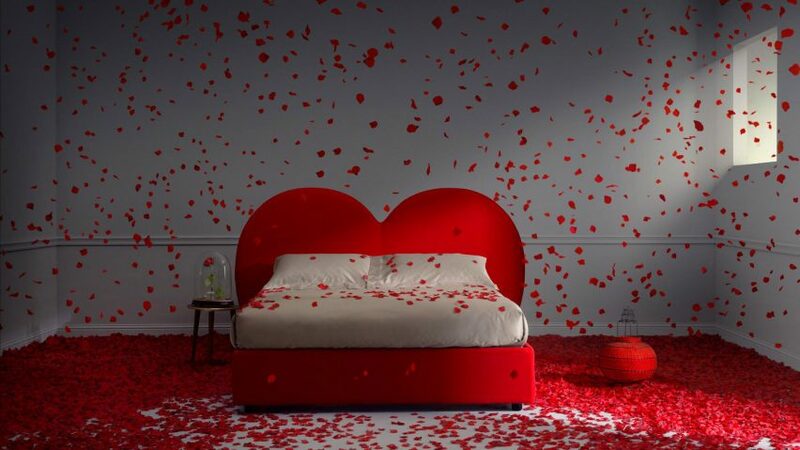 Fabio Novembre designs beds inspired by the "world of dreams"
Fabio Novembre designs six beds inspired by "the world of dreams"
Italian designer Fabio Novembre has created a range of beds influenced by fairytales for mattress brand PerDormire. Novembre was invited by the Italian manufacturer to create a range of upholstered beds with a unique spin, for its affordable Design Democratico collection. He responded with a series of six designs inspired by "the world of dreams". Each one refers to a different aspect of fairytales, from castles and moons, to queens and princesses. "I live with two princesses aged 13 and nine, my daughters, so referring to fairytales was my most natural approach," Novembre told Dezeen. "My house is always full of little girls, each with their own taste," he continued. "Sticking to one specific fairytale is almost forbidden." The Regina bed is named after the Italian word for queen. It features a red heart-shaped frame that is meant to resemble the curved shape of a corset. Principessa – meaning princess – has a green quilted texture that evokes "embrace and relief"
By contrast, Principessa – meaning princess – has a green quilted texture that evokes "embrace and relief". "The beds tell little stories, simple hints at enchanted worlds where everyone can imagine themselves and each type can exist in a more or less explicit version, adapting to various types of customers," said Novembre. Another design is the moon-themed Luna. This bed has a crescent-shaped headboard and a texture that mimics the craters of the moon. There is also Castello, meaning castle, which has brick-patterned stitching, and Abito, meaning dress, which has the drape of a gown. The collection is completed by Nuvola, which has a cream-coloured headboard with a cloud-like shape. Nuvola has a cream-coloured headboard with a cloud-like shape. Upholstered fabric covers all six bed frames, to maximise comfort. "The choice of using upholstered solutions for all the beds was taken in order to keep comfort as the main topic: everything had to be soft and cosy, no edgy angles and no hard surfaces," explained Novembre. "Sleeping is the most helpless condition of our life, making it comfortable and dreamy was the least I could do," he added. Novembre is known for his surreal interpretations of everyday objects. Past projects include huge faces for sitting in for Driade, and a pair of chairs that look like kneeling naked figures for Casamania.